Our firepit has a roaming spirit. 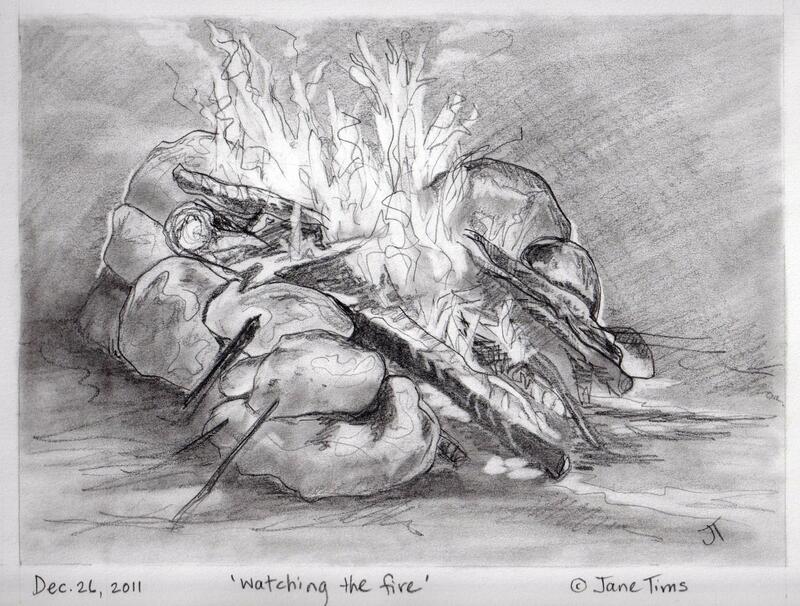 It began its days in front of the house and we had many wonderful evening fires. Then, as the years passed, the maple tree overhead grew until it was dangerous to have a fire under such a thick canopy. To improve the safety of the firepit, I moved it, stone by stone to the back of the house, reassembling it exactly as it was. We had a few fires and then, one day, our lives became busy. We kept taking wood for the next fire and the next fire never happened. Gradually the pile became so large, you could not see the firepit! Last month, my husband put our tractor to use to move the firepit one more time. I clawed my way into the pile of scrap wood and uncovered the stones. Then we pushed them into the bucket of the tractor and away they went, to their new home across the yard. Now they are in the driveway, waiting for their new home (see the plan in ‘plans for a rocky road’ November 13, 2011 under the category ‘the rock project’). 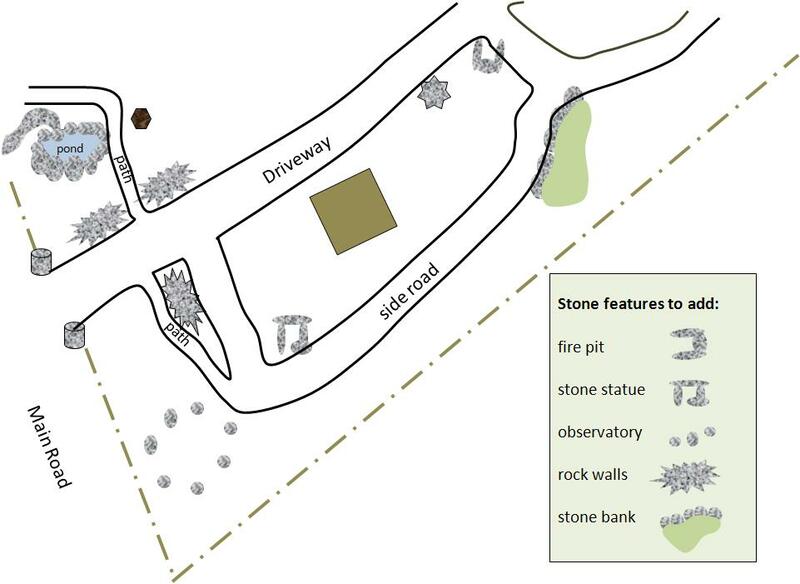 The next step will be to fell four spruce trees in the area of the firepit, to make sure we can have our fires safely. 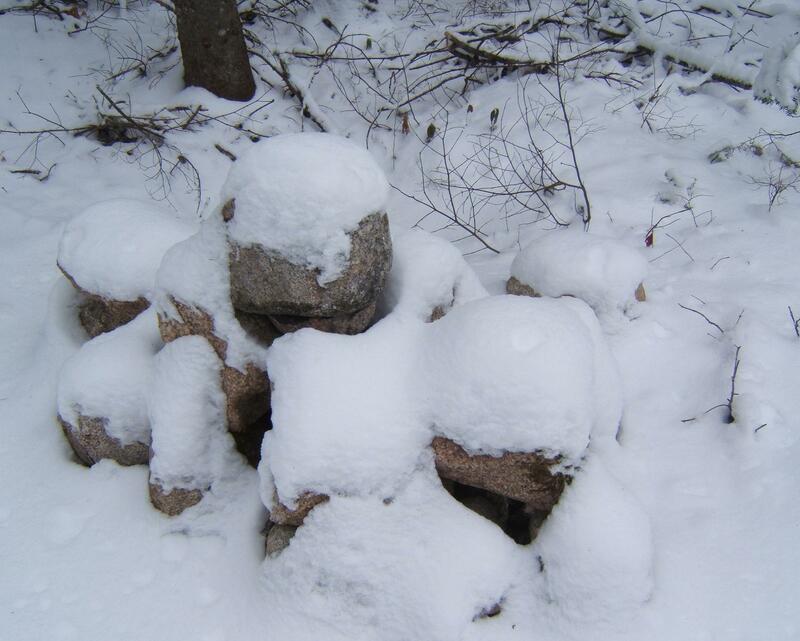 This next step may have to wait until spring since the stones are now in the frozen throes of winter! 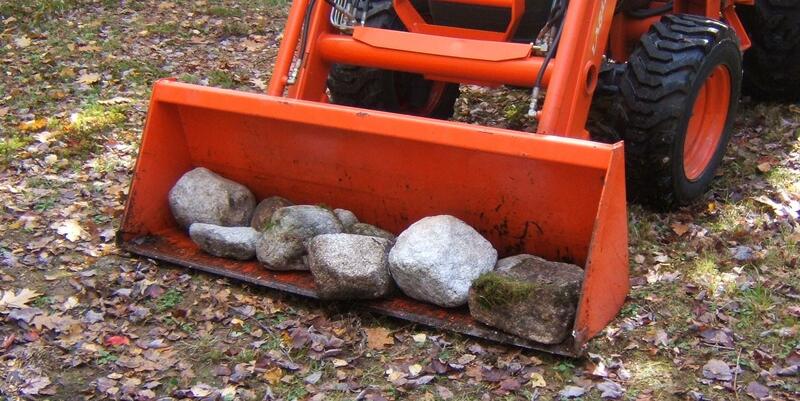 This fall, we have begun a new landscaping project, using rocks to embellish a length of road on our property. On our travels this summer, we were impressed by the many ways home landscapers use stone as a signature element. 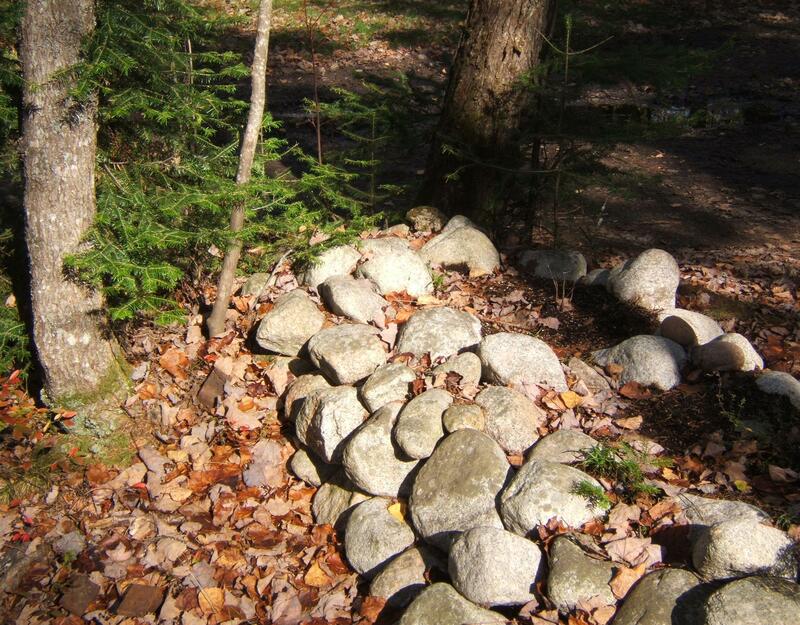 Some of these ventures were as simple as a stone wall snaking through the woods. 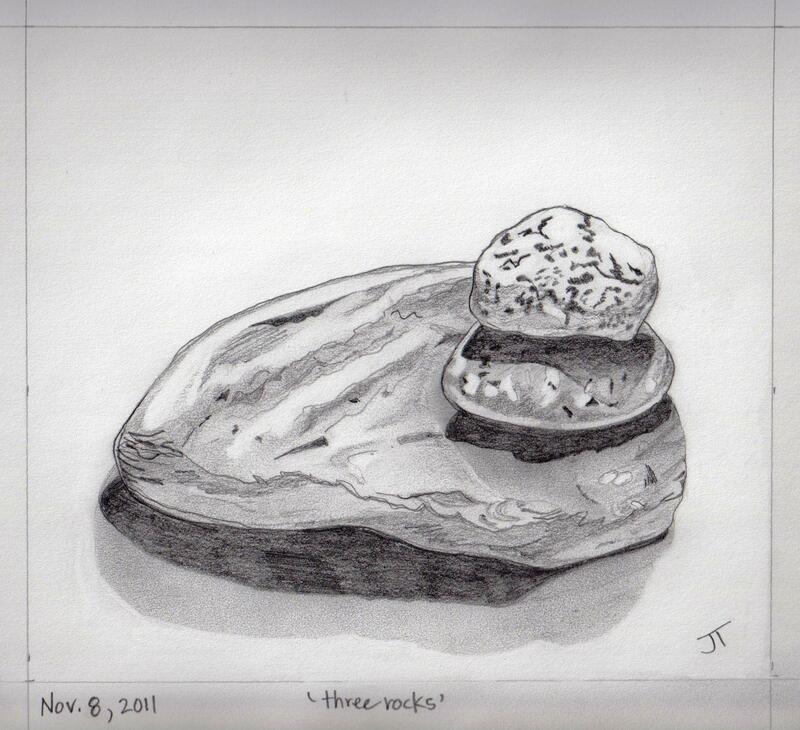 Some had elaborate stone benches, stone sculptures, or carefully-built piles of stones. We have an offshoot to our driveway, intended some day to form half of a circular road. Over the years, we have added some stone embellishments to this road and its associated path, so it seems to me to be the perfect place to develop our own rock project. a stone ‘stream’ built years ago before we purchased more property and Fern Gully Brook entered our lives – this stream is a one foot wide course of small stones screened from a pile of pit-run gravel. It ‘runs’ from a small artificial pond and is now completely overflowing with dry leaves. 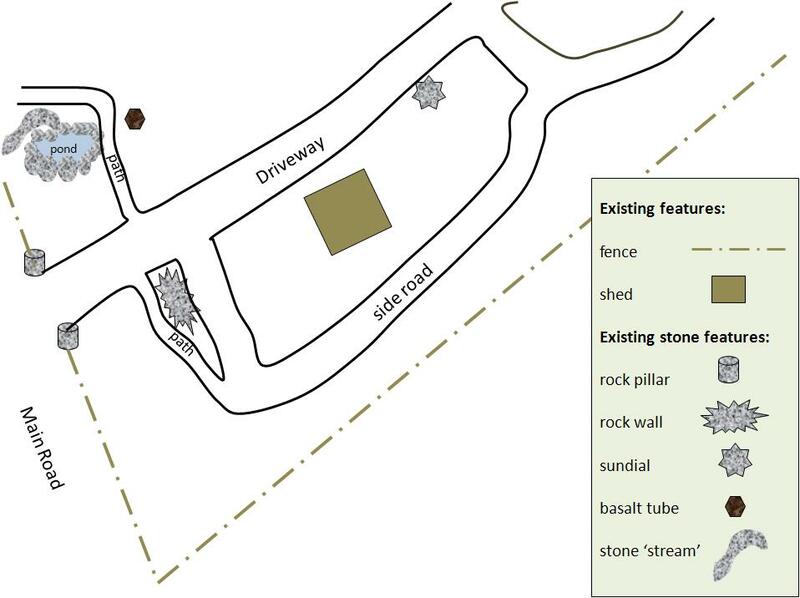 build a stone embankment-with-moss feature to emulate a lovely roadway we saw at my brother’s wedding last year. 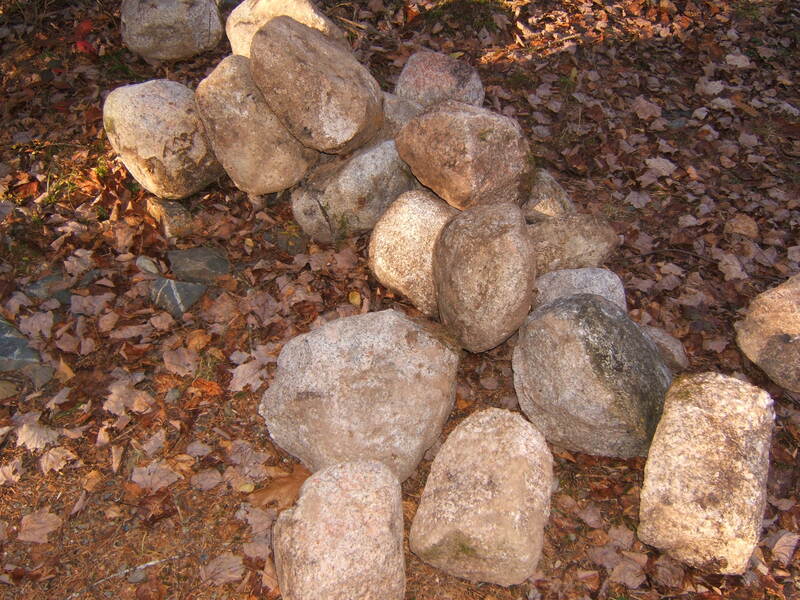 Over the next year, it is my intention to report back on the progress made on our Rock Project. If you never hear another word about this project, remember – I like to plan.